Where Are Your Google Cloud Data Center Locations? We use Google Cloud Platform’s multi-regional deployment mode. 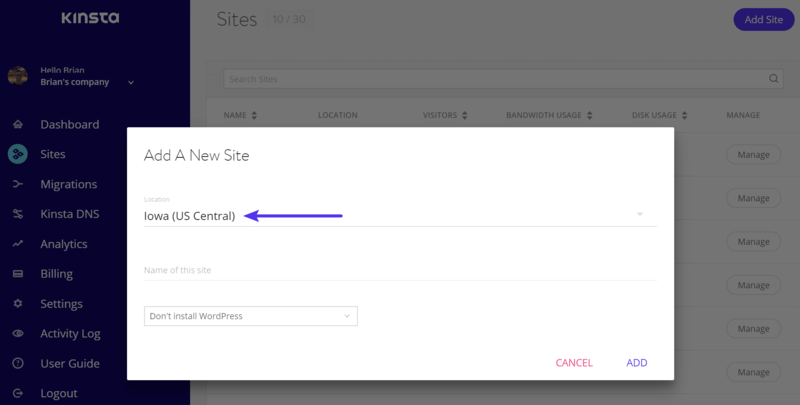 This means that you can choose between different Google Cloud data center locations for each of your WordPress websites, which allows you to place your website in a geographical location closest to your visitors. This ensures low latency and blazing fast load times. The Google Cloud Platform locations are available in MyKinsta when you add a new site. If you are interested in moving your existing WordPress site, simply open up a support ticket. Moving locations requires an IP address change and additional steps from our team. Our previous locations were already very centrally located, so we only recommend moving if are serving customers or visitors in a specific geographical location. For example, if you run a local e-commerce shop in Sydney, Australia, our previous closest location would have been Taiwan. Now we have a Sydney location available which could definitely decrease load times and latency. Feel free to ask our team if you have questions. Some notable companies that are using Google Cloud data center locations include Spotify, Snapchat, HTC, Best Buy, Philips, Coca Cola, Domino’s, Feedly, ShareThis, Sony Music, and Ubisoft. Even Apple has been seen moving some of its services away from AWS, spending between $400 million and $600 million on Google Cloud Platform; although this couldn’t be independently confirmed. See a full list of case studies and companies utilizing different services on Google Cloud Platform. → Does Kinsta Offer Shared, VPS, or Dedicated Server Hosting? → Do you offer SFTP? → Which Is the Best Data Center to Choose?